Why Micro Influencer Marketing in China Evolved? Home/Influencer Marketing, Micro-influencers/Why Micro Influencer Marketing in China Evolved? 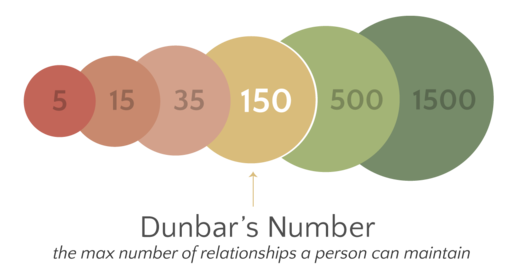 Most of us are familiar with Dunbar’s number. The theory posits our brains evolved with the ability to maintain about 150 stable relationships at the most. Far fewer know that Robin Dunbar and other researchers have, in recent years, tested this theory for online social networks. The results are fascinating and can help us understand why micro influencer marketing often beats traditional marketing methods for ROI. Think about the last time you searched for restaurant reviews, some how-to guide, or insurance quotes. As paid listings occupy more and more of search engines’ first page results (up to 10 paid ads on the first page of a Google search and the entire first page of results on Baidu), you probably skip them automatically without even apprehending the headers. I do when I notice the little green ad sign — and it’s not a conscious decision. Some of those products might be great, but an instinctual mistrust barrier makes us skim. WeChat, a wildly popular private network social messenger app, is a hot bed for micro influencer marketing. While the traditional marketer hopes to reach hundreds of thousands of people as fast as possibly, WeChat shows how more limited, targets action can prove better. In a 2015 study done by Robin Dunbar, found that his earlier theory applies to online networks. Even though you might have innumerable “friends,” most of whom you’ve actually met at some point, the number of social ties you can maintain is limited as it is in real life. “Respondents who had unusually large networks did not increase the numbers of close friendships they had but rather added more loosely defined acquaintances into their friendship circle,” wrote Dunbar. The flaw of general “brand awareness” campaigns stems from the fact today’s mediums let people discover whatever they want with a click of a button. Search engines, instant messaging, and the ease of advertising to millions mean consumers are aware of too many brands and products. Many of them are certainly interesting or valuable, but without a personal level of trust, they are noise from outside one’s community of influence. Some brands are willing to pay up to $55 CPC to get on that first page. However, the feeling of finding content yourself, whether through research or a social network, versus having that content thrust upon you is qualitatively different. The former is stickier on an instinctual level. The underlying reasons would take a full evolutionary psychology book to explore, but the connection to the cognitive limits of our relationships is evident. Long ago, content was scarce and therefore valuable. Scholars went to great lengths to memorize useful texts, which were tools of reference and information recall. Think about how differently we approach books now, even though they’re made of the same building blocks. Reading something start-to-finish before forgetting it entirely by the next day would have seemed absurd to bookwormish monks in their cloisters, yet that’s exactly what happens as the medium of our communication changed. The reality is content is cheap. Even if you spend thousands of dollars on research, filming, writing and editing to create a multimedia ad package, most people will forget it faster than a quote from a micro influencer they trust. Digital evolution has given us too much irrelevant and disruptive information. Internet users are forced to compartmentalize, and private social messenger apps hold what’s genuinely important to them. They’re our little caves of 150 people — family, friends, co-workers, and a few influencers — and a tribal cave wouldn’t amount to much if anyone could saunter in. A traditional approach to marketing just doesn’t work on social media. Brands aren’t family, friends, or co-workers — they don’t provide the kind of value or social experience people want when they use messenger apps. For an example of a brand using these limitations to their advantage, take a look at how Maybelline accessed tribes of influencers. I love this article. Well done.